Being a Realtor in NW Wyoming can be seen with varied days and interesting unexpected events! The other day, I stopped to feed my dad’s horses before opening the office as he had early morning meetings. It was 20 degrees outside, snow on the ground, and the wind was blowing Mach 60, which made it feel like -10 outside that day! 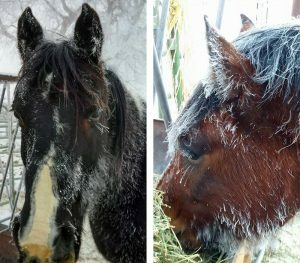 I proceeded to blaze thru the wind to the hose corrals all bundled up—barely able to see in fogged up glasses; quickly throwing hay over metal horse pens with it all coming back at me in a whirlwind of snowy cold covering me in alpha sprigs. I brushed myself off, stomped my boots and proceeded to the office after giving the horses a pet on the nose, and opening the gate for them to go out to pasture for a little exercise. A little dirt never hurts anybody. I thought to myself – no one will notice my now dirty hay covered pants, and the slight manure scuff on my boots. Ha! I got to the office and prepared for my day after mom handed me a to-go egg breakfast sandwich to get me on my way. She saw my attire after horse feeding, and we both just smurked at each other and chuckled. An hour later hard at work, I got a call from the neighbors, “I think your dad’s horses are in my pasture – I put them in the round pen – we are about a mile down the road from their house.” Oh Jeez, I thought – The horses are out! I quickly closed the office – transferred the work phone to my cell phone and then stopped at my dad’s for halters and cubes and sped out to the neighbors. There stood Cash and Little Joe – the paint, and the wild mustang – happy as all get out to have gone on a little adventure. They had stepped over the electric fence surrounding the pasture, which wasn’t on I came to discover. The neighbor was very nice, not to mention she had them calm and ready for travel back to pa’s house. Her husband showed up conveniently just as we were catching the horses and trying to figure out best methods to get them back to their pen without a horse trailer. He said, “hop on the tail gate of the truck, each of you hold a horse, and we will trot them back to your dad’s house”. That’s a great solution, I thought! 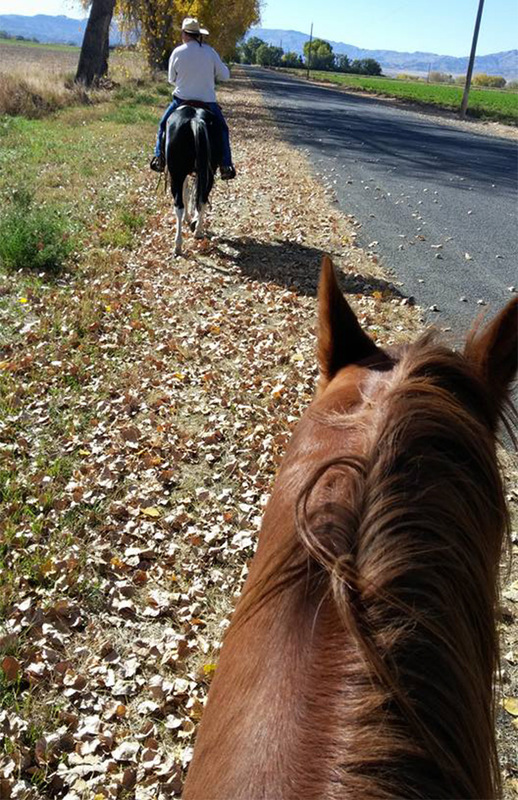 It was a bit of a chilly ride, but luckily not far – best neighbors my parents could ask for! It just so happened that they were looking for real estate – so we talked about possibility’s – you never know when little in-conveniences pop up in your day how rewarding they can be on many levels! We do show property on horse-back from time-to-time if your ever looking for properties in the great expanse! Give us a Call: 307-754-9400 in Powell or 307-373-2565 in Greybull.